TAJ MAHAL MIX - Nut Mix with cashew, peanut, pecan, macadamia, pine kernels, curry and chilli. PEANUT, ALMOND, CASHEW, macadamia, vegetable oil, WHEAT, salt, PECAN, pistachio, pine NUTS, EGG, onion, sugar, chili, curry, spices. May contain traces of SOY, MUSTARD, SESAME, sulphur dioxide and SULPHITES. It can hardly imagine a sensual country, as the mysterious subcontinent with its many exotic spices. The charming India has that ingenious use of many spices and herbs, which makes the cuisine of this country at the same time wonderfully exotic and so seductive. Looking for the perfect blend of spices we have set first carefully that crunchy cashew, peanut, pecan, macadamia and pine kernels in a perfect mixing ratio. 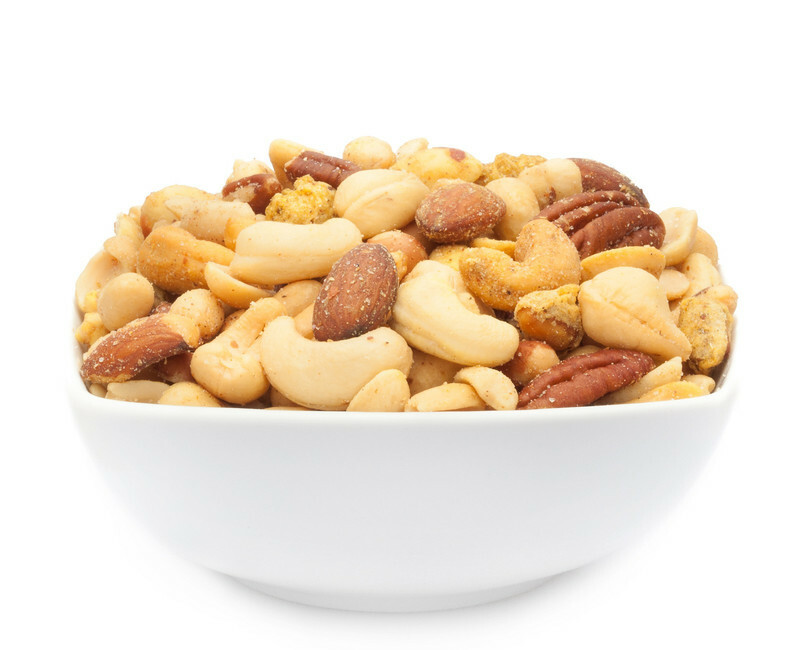 This mix is ideal with curry and chilli, which finally gives our nuts the enchanting oriental flavour that characterizes as much the fantastic and tasteful of the TAJ MAHAL MIX. Abundant and perfect in flavour and presents our TAJ MAHAL MIX with carefully matched individual components of walnut spiciness. Soft earth tones, exotic curry touch and in between surprised the smooth chilli sharpness that gently wraps the cashews, peanuts, pecans, macadamias and pine kernels and pulls you with each new bite in the spell of India. The rich aroma feeds in the taste buds and offers an ideal foundation for our wonderful Nut Mix. That crisp, mild and nutty madness seduces the palate. The Taj Mahal is considered thanks to the harmony of its proportions as one of the most beautiful and important examples of buildings that were built in the early India. In a colourful mode have we this magnificent building customized: bright rich beige tones and darker shades - our cashews, peanuts, pecans, macadamias and pine kernels are reflecting the wonderfully and distinctive architecture of the Taj Mahal. Rich full from the ingredients which provide the flavours and tastes set the tone and the perfect snack experience for the time left between meals. Whit this mind: Namaste TAJ MAHAL MIX!